Around here Albert Katz is known as a Farmer's Market "addict" and this includes his search for the perfect market bag that is "heavyweight" enough to carry his weekly haul! 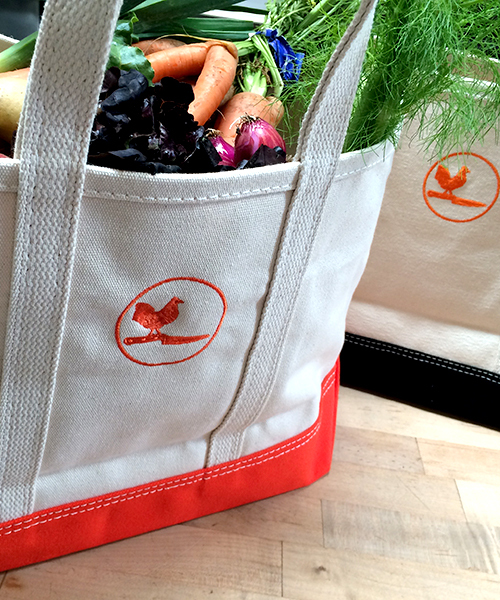 This superior American-made durable canvas tote just happens to look great with our fun embroidered orange chicken logo, and the boxed bottom allows it to stand upright for easy filling! These extra large cotton duck canvas bags are tough, reinforced top and bottom with perfect top stitching, with special 6" handles for comfortable carrying, and will last for years of serious shopping. To help keep track of your keys and cell phone while shopping, we added an interior pocket. This family company has been making canvas products for nearly 100 years and it shows in the quality of workmanship and detail. Our KATZ Market Bag comes in two canvas boxed bottom colors... select from either orange or black...both with our embroidered orange logo.